This is my fourth post with "Almost Killed Me" in the title. I just counted. I thought there were more! But seriously. There were so many scenarios today in which I could have, like, seriously died. You guys. Like. For real. Geoffrey and I have been sober for precisely one year today. Here's my post when I decided to quit, written 6-3-2016: I've Had My Last Drink. And we celebrated by running a triathlon in Cooperstown, NY. That's not the reason I signed up for it, but I'm glad it worked out this way. I could not have picked a better way to honor one year of sobriety. Here's how I actually signed up for it. 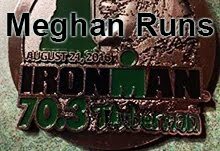 I Googled New York State triathlons and picked the first one this season. I excitedly told Geoffrey, dude, I found us a tri the first weekend in June! He stared at me. Then he said, "I know, I told you about it a month ago." He totally, totally did. And I had completely forgotten about it. Last night, Friday, I had planned on going to bed super early. My alarm was set for 3:15am. I naively thought, "hey, I can totally get 8 hours of sleep!" Hahaha. Instead I stayed up late, reading a book I just got recently (The Way of Kings by Brandon Sanderson). Totally addicted. I finally went to bed some time after 9. At 11 I was woken up by a TXT. That's not right. My phone automatically goes on Do Not Disturb after 10. Did I really... just, stay up that late? I'm so dumb. Anyway. It was a TXT from Geoffrey. He had gone to a concert where his son performed (his son is an awesome singer, and apparently a bada$$ stage performer too). The TXT said he was flaking on the tri. I went to sleep. My alarm rang and I got up in the middle of the night. I eventually trudged downstairs looking for coffee. And there was Geoffrey, bouncing around like the Swedish Chef. Apparently three hours of sleep is totally enough to run a triathlon. I'm down with that. I'm pretty sure he and I have both run a marathon on only that much sleep. 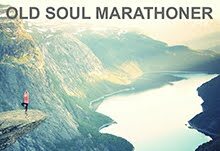 Which marathon was it, that we stayed up till 2am drinking then got up and ran an epic marathon? Oh, right, most of them. Clean and sober you guys! We packed all our $hit and left the house about 4am. After half an hour, Geoffrey reclined the passenger seat and went back to sleep. So I'm driving by myself, tired, for 2 hours, on roads I'm unfamiliar with. Most of the roads were marked as 55, but they were full of twists and turns and hills. And covered with deer. I mean, these roads were, just, swarming with creatures. So, we almost died before we even got there. Lucky for Geoffrey, he slept through that part. We got there and did all the things. Got our bibs, hit the bathrooms, set up our staging areas, hit the bathrooms, got our timing chips and some coffee, changed (hey, since I'm already in the bathroom...), put on our wetsuits. Of course, immediately after putting on my wetsuit, I had to pee. A lot. I did not take it off to pee. Let your imagination run wild on how I resolved that situation. Did I mention it was cold? Really cold. On the drive, it was 37 degrees, 40 when we got there. I had to sit in my car and run the heat for a while before putting on my wetsuit. It was super cold. We had to swim in a cold lake. Then, soaked, we had to bike in crazy wind. And then run with zero feeling in our bodies. That was the outlook at the start of the race. Before we even began, the race coordinator offered for folks to skip the swim and just bike and run. Several very intelligent people took him up on that. I'm not smart. I stayed. Maybe you're not a triathlete. Let me tell you what happens when you swim in cold water. You can't breathe. One. In case you've never swam before, breathing is way critical. Your limbs get paralyzed. Two. It's like swimming with four baseball bats attached to your torso. Not great for your stroke. Your exposed flesh gets downright hypothermic. Three. I kept lifting my face up to "sight". But really, I just couldn't feel my face. Oh, and all that can make your body freak out and you drown. So, almost death. Again. The race man had told us we could just swim from kayak to kayak. That's 100% legit per USAT rules. It's nice, but not very encouraging. "Guys! You don't have to swim in this awful water! Really, you don't! But if you're super crazy, you can just go from kayak to kayak! And if you flounder and start drowning, we'll totally try to save you!" I won't lie. It was awesome. And I swam my fastest ever. We took forever in transition. Our bodies would not cooperate at all. Taking of the wetsuit is always rough, but try doing it with non-functional digits. My shoes were impossible to put on. And then I put on as much clothing as I had brought to the staging area. After several hours, I left the staging area and started biking! The ride was beautiful, but hilly. It was two loops. And it was uphill the entire time. Seriously. The entire time it was uphill. And the wind! I'm not sure what direction it was coming from, but it was always a headwind. No lie. I had zero feeling in my feet the entire time. I realize this post is loaded with hyperbole. But that thing is 100% true. I could feel precisely one pinky toe. That was it. Apparently Geoffrey couldn't feel any part of his legs. We talked about this in the car on the way back, about how weird it is to bicycle when your body gives you no feedback on how hard you're working. Geoffrey had his power meter and heart rate monitor to give him that feedback. I had my rage and Russian stubbornness. And to stick to the theme of the post, I totally could have fallen and died. Or at least gotten maimed. Probably by a passing deer. And the run! The run is the one thing I'm good at. I've gotten my swimming up to "average" (which actually makes me happy). My biking is still slow. But running! Kapow. I nuked the run. But I had no sensation in my feet at all. One of Geoffrey's buddies, Joe, who was there too, described it as running with balled up socks in your shoes. That's what it felt like. The sensation returned to my feet in patches. So it felt like there was something in my shoe the whole time. Of course, I wore my minimalist shoes, and without any tactile feedback, any errant rock could have killed me (ok, maybe not). The run was also two loops, with a huge hill that we had to do twice. I smoked that hill and averaged 6:49 for the whole 5k. Don't ask me my speed on the other two portions. Geoffrey got third in his division and got a pint glass, which smashed to pieces thanks to the wind (really for serious). I don't know how I did because the timing company screwed up. But I felt good! On our way home, Geoffrey fell asleep again. I drove recklessly, half-asleep myself. I'm surprised the many rumble strips I hit didn't wake Geoffrey up. All that makes it sound like it was a miserable experience. It was amazing. It was a perfect first tri of the season. As I mentioned to Geoffrey, we got the brutal race out of the way, so that we'd have "good race karma" going forward. I loved the challenge. The feeling of crossing the finish line was incomparable. Our medals were truly earned. Ironman training is intense. It's just month after month of exhausting work. 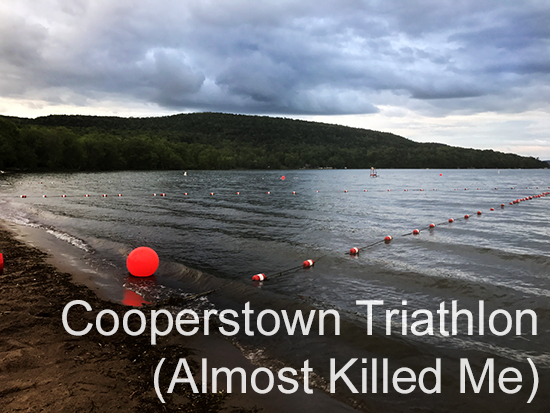 The Cooperstown triathlon reminded me why we do all that hard work. It's one of the funnest and awesomest things you can ever do. The natural high you get from it.... Well worth the risk of death. I would absolutely do it again. Frozen water, suicidal deer, and all. Geoffrey and I have suffered through that together. Battling our personal demons. Making the decision to quit drinking to exorcise those demons. And then striving to become better people via exercise (see what I did there? Homonym for the win!). And after a year of brutal self-purification, we rewarded ourselves.... with a brutal race. Today's race reminded us how strong we are. What we are capable of. Why we do what we do. How much we are capable of. I only wish I could confer that empowering sense of pride to all the other folks in the world who struggle and suffer. But maybe a few will read this and turn onto that difficult road. Because the reward at the end of that road is glorious.